When the day started sunny, it’s time to leave. We flew to London (Gatwick) from Nice airport with British Airways. It’s amazingly cheap flight, about euro180 for all three of us (we took one person with luggage and 2 others with hand luggage only, with saved 20 per person). It’s the same price as easyjet as easyjet charged additional for all check in luggage as well as food. Sometimes it’s worth shopping around although I tended not to do enough of it. The first 30min was flying over the Alps with snow capped mountains. Very pretty. Nina sat on her own for landing. London was sunny but chilly, and big. We took one train, one tube and one bus to get to Nicolas’ brother O’s place. We went to a nearby playground to play, yes, in the cold, and quickly retreated to a tea house for afternoon tea. After all we were in London, the home of English tea. What strikes me most was the colours of the doors of the semi houses in the neighbourhood. Rather homogeneous house, dashing variety of door colours! Olivier family house was being renovated with taste and style. Like it. Then the family all came back home one after another. A typical weekday evening for a household with 2 school kids I guess, dinner, shower, homework, a bit of tv, chat, and bed. Ah home. Nina woke up before 6am screaming. Was she having a bad dream or just het nappy was overflowing? We wouldn’t know. But we changed her and for the first time took her to our bed to finish off the sleep. It wasn’t too bad. At least we now knew that we could share a bed when it came to it. Well, the priority in such a trip was really all about these mundane things: sleeping, bedding, eating. Plus a bit of other things such as sightseeing and experiencing. We set off at 10 for our big day. It stopped raining, even sunshine once in a while, but freezing cold. Took bus 94 to Queensway stop, to Princess Diana’s park, aka, Peter Pan themed playground. Big, pirate ship, tepees etc, squirrels, quite cute. Nina couldn’t care less about all these themed things though. For her it’s a giant [playground with squirrels to chase after, and that was good enough. Then we had to walk through the vast royal park and Hyde park to find a lunch place as she started to make the ‘I’m hungry’ noise . We ended up in the cafe of Natural History Museum. A huge salad for £6 was more than reasonable. The museum itself was gigantic, filled with fascinating stuff: stones, dinosaurs, whales, simulation of wind and current etc. Dinosaurs were one of the highlights – all these casts, reconstruction, models were vividly presented in front of us. I particularly – Nina too – liked the elevated walk to see these giants from their height. The building itself was highly elaborated already – I later learnt that the building was actually purposefully designed and constructed for being a museum. All these for free (well donation recommended). That’s really what showed the glory of a country. Passed by Victoria and Albert Museum, a glance over the hall, interesting exhibition of design I suppose. An extremely good looking neighborhood I have to say – one of the most expensive ones I suppose as well. Where the French school is. Harrods. Yes good looking tea and chocolate room, but apart from that, really just another luxury shopping mall. Not my cup of tea. Then our mission to come back home. 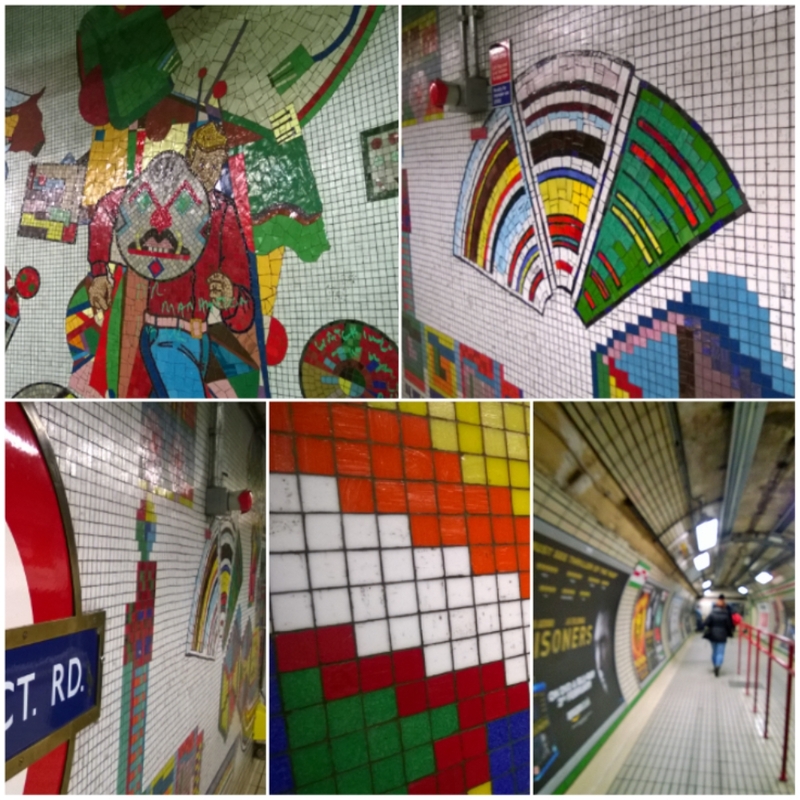 3 metro lines, long flights of stairs with no lift, bus, walk… It took us about 1h30 to get back home. Do I want to live again in a big city like London? By the time we waited for rain to stop to leave home and got off the London bridge stop, we found ourselves right in front of Bourough market. What a treat!! A beautifully curated upscale market, yet remained authentic market feel: lots of producers, small stands, takeaway, eat while walking, etc. Lots of French products we noticed. Had a confit de canard sandwich, freshly made pasta with ingredients coming from Italy as they proudly claimed, and omelet (the least successful among all). Then walked down along the Thames. Southward cathedral that Nina loved to run wild. Luckily it’s weekday hence not much people around. New Tate. Indeed a bit disappointing as there was not much that really strike me – I had a much more favorable memory from last time’s visit (10 yrs ago almost!) . But the visitors who were drawing on the tablet board next to the cafe was doing some fascinating work. 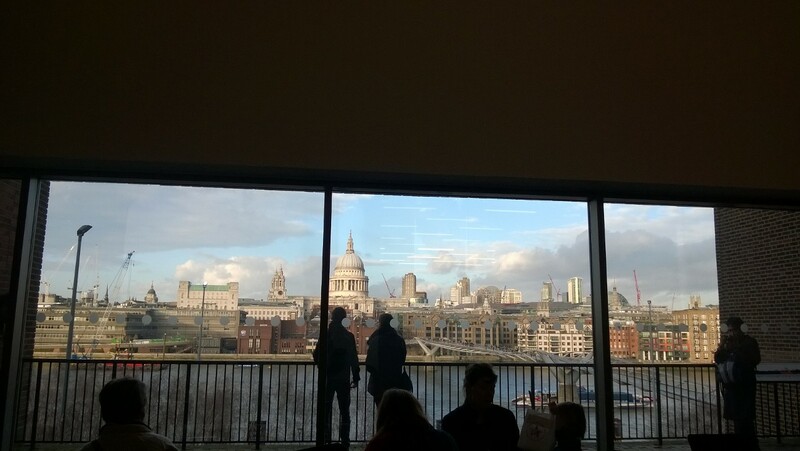 The view onto London from the cafe was fabulous too. Walked through the millennium bridge to the other side, past by St Paul’s, took our train home. Nina started to love bath in the big bath tube, twice a day these days! For a change I went along with S, my sister in law, to her yoga class. Flow yoga …dynamic to say the least. A real sport. I expected some muscle reactions. The class was organized with some mothers of the French school, so it’s a French speaking yoga class, in London. Life could be funny. 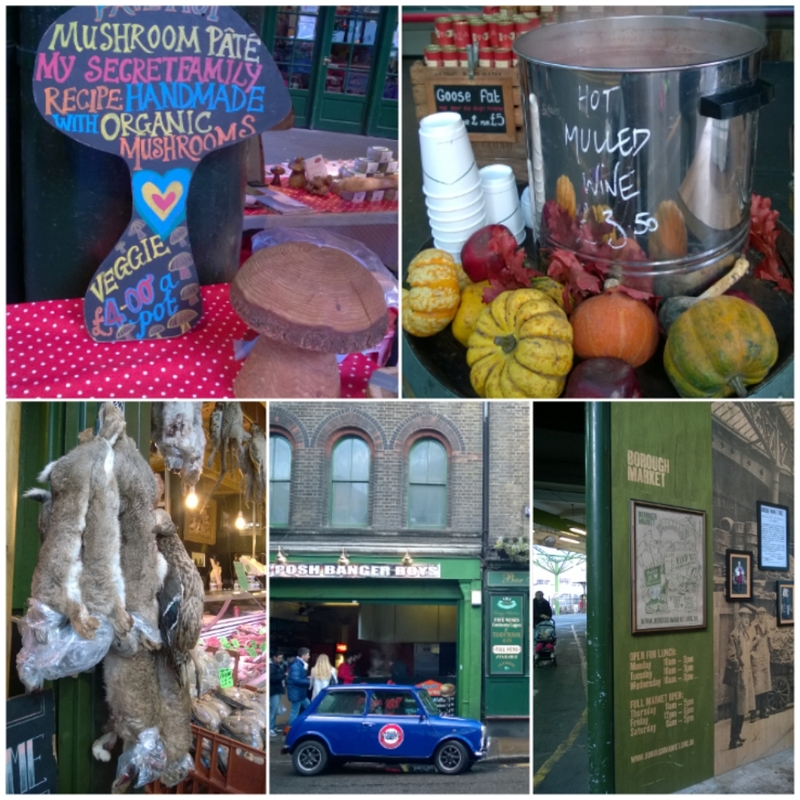 I’m glad I got to peek into a bit of local (albeit expat) life here in London. After lunch, I proposed to bring Nina out while Nicolas stayed home to rest, because he looked exhausted. We went to British museum. Well it’s nowhere near as interesting as Natural History Museum as far as Nina was concerned, because everything was inside a box or a case, there was nothing to touch. So I became her only source of entertainment… hide and seek, chasing … She felt asleep finally to leave me watch the tea ceremony demonstration in Japan area (one has to be patient to get his tea to drink), and the fascinating Mesopotamia area (mental note, have to visit Iran and around one day). Their so-called level access lift was a funny little device that you had to keep pressing the button to move up or down (normally often just one meter high). The metro system in London is among the oldest (if not THE oldest) in the world. Hence, no lift in most stations. Well, I used my sheer muscle power to carry the pram (which is called buggies or push chair here). Up and down the stairs. Most of time there was someone coming forward to help nicely but not always. The weather kept surprising me, no rain, even sunny from time to time. It’s Saturday, the B. family were all free today, and we were going to eat Chinese! A quite fusion one called Yauatcha唐茶苑. Some really good dim sum. 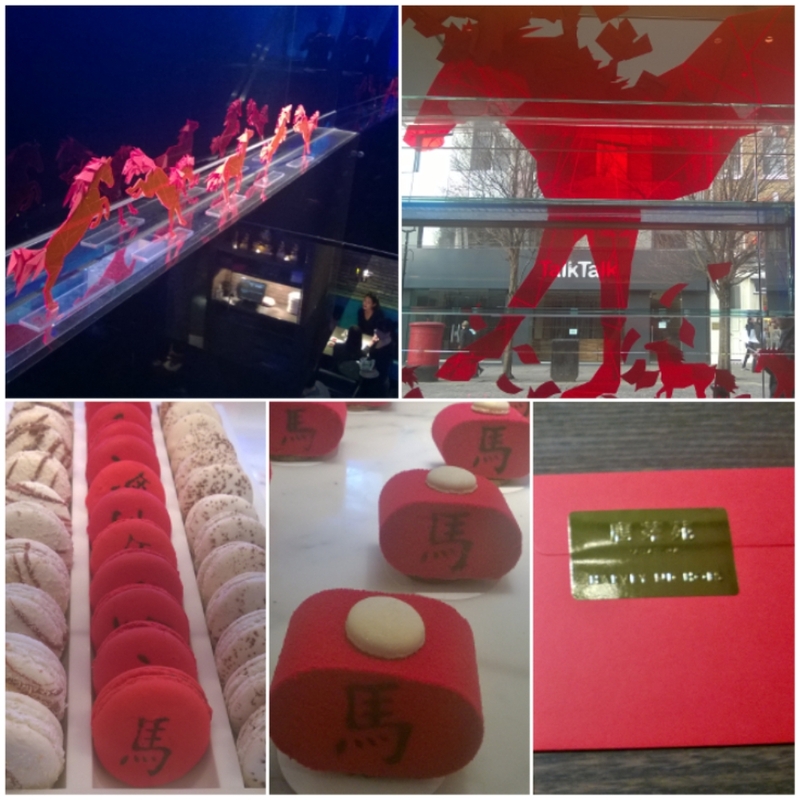 They also had a quite impressive collection of desserts, such as macaroni, a concept non-Chinese but with Chinese flavor such as red bean, peanut, five spice flavor. They had an enormous red horse at shop front and many tiny red horses in every corner of the restaurant. It’s for the upcoming Chinese New Year. Nina absolutely loved every fish in the fish tank. She is a real Chinese. E started to claim that he’s 12.5% Aussie and 12.5% Chinese because of his cousin. Passed by several really cool shops, such as B1866 for the accessories of bikes, and a chocolaterie called Said (with really good hot chocolate according to Z a connoisseur of chocolate, and tiny cup/spoon etc made from chocolate). This was one upside of living in a metropolitan city, with all cool varieties. China town was fully decorated to the Chinese new year, red lanterns, horses. You name it. Covent garden: without all these crowds it must be a lovely place. Apple had a prime place and building for displaying their gadgets. Pub dinner with boys while 2 girls of the family went to ballet at royal opera house. Tonight turned out to be Scottish Burns Night – haggis, whiskey, poetry. Burns was a poet. Bought the very delicious pamelo. It brought back the memory of my childhood – a winter fruit, a treat normally happening around new year. Today was Australian Day. It looked another sunny day in Sydney. It’s my first Australian day as an Aussie. We were to meet my old friend In. and her hubby E. and son A. at Natural History Museum at 2:30pm. At 1:30 we finished lunch nearby and were horrified by the length of the queue (feels like back in China), hence went to V&A next door which had no queue. It turned out I had already waited for more than 30min in the queue and were still 10 more minutes to go. We finally settled at the cafe in V&A, thanks to Nicolas who found a table among an overcrowded cafe. I have to say the cafe was extremely well decorated with the real art works and sculptures dotted around under a Victorian dome style roof. Last time when l met In it was in Shanghai, more than at least 6yrs ago. We first met in Alliance Francaise in Shanghai over our weekend French class, then a few years later bumped each other in the bathroom of ESC Grenoble in France, and since loosely kept contact through facebook. She stayed in Europe (France then England) while I moved back to Shanghai then to Sydney. Things had changed for both of us, but there was something magic about meeting old friends, as if time flew by in speed and years of life was condensed into a pot of tea. I found Nina now was a bit more comfortable with strangers. Perhaps it was the constant change during the trip that helped her to get used to the idea of new faces and new things? She even signaled to hold A’s hands (yet been refused :)). 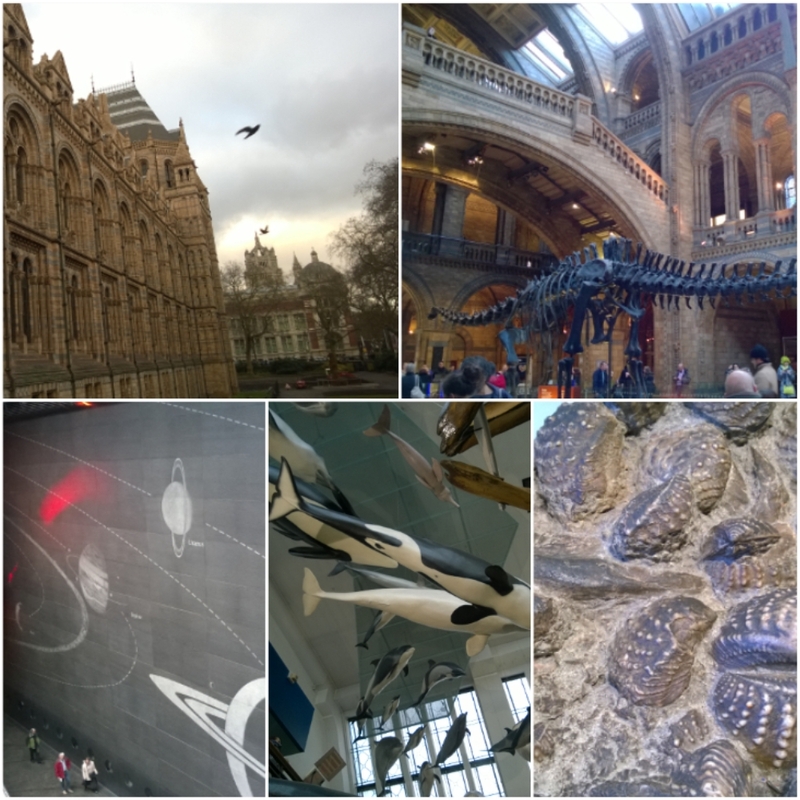 When we returned to the NHM to see the dinosaur, there was still a long line in front of the dinosaur section. Weekend was not a time to visit these popular places. We woke up to an almost blue sky! Wondered off to St James’ Park as suggested by my friend Z.Y. Indeed an oasis in the middle of the city. Massive, lots of birds and animals including squirrels and pelicans. Views onto London eye. Then we saw the horse polices blocking off the road, and heard the music. Nina wanted to see 马 /horse. I told her it’s .警察阿姨， then the whole day she was just practicing 马，阿姨. It’s in fact the guardians who were going to the relay/change ceremony (is it how you say it? ), that passed right in front of our eyes. But when we got closer to the Buckingham Palace I was shocked by the amount of people waiting to watch the ceremony. The polices were nice enough though to allow the kids and prams to come forward to see the passing parade a bit more closely. A few days ago, Nina saw me walk into the room and said 妈妈来了. That was the first sentence she said which that actually made sense. She hasn’t since reproduced it but I’m quite happy with her progress despite the fact that she still didn’t say much to the date. She most certainly understood what she was hearing and trying to reproduce. 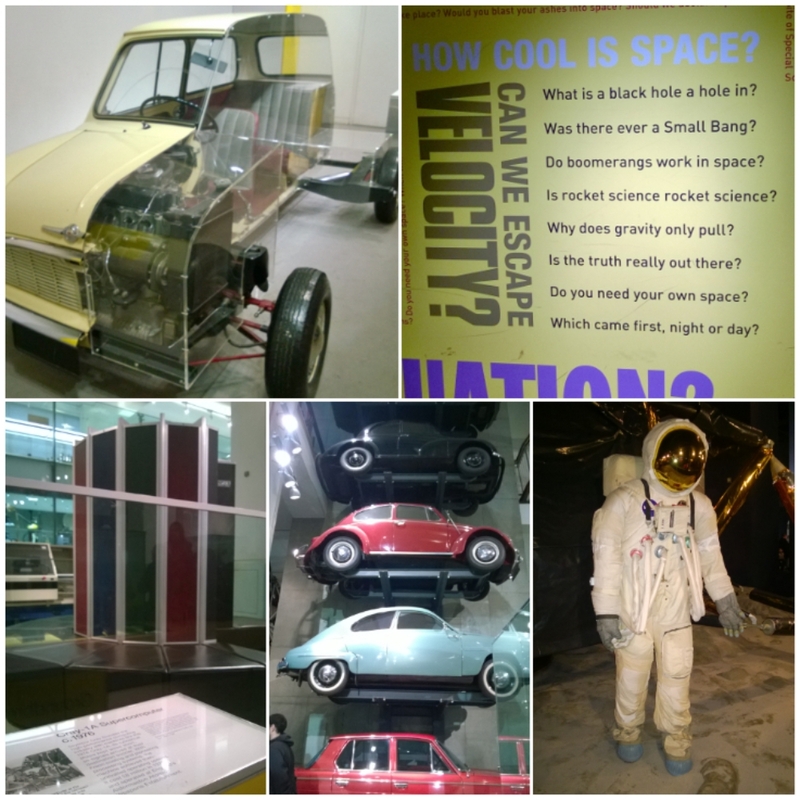 After having a quick lunch at pret-a-manger (many French influence in the London culinary scene), we headed out to Science Museum. Through back streets at my request. We passed by a neighborhood full of embassies. Science museum. Nina slept 1h30 through the visit. I learnt that mini motor was revolutionary in the industry (so powerful yet taking so little space), what astronauts eat (those going to mars for a project of 3 yes will have to learn how to grow certain things themselves), 3-wheeled cars etc. E. joined us after his school. He had his first pearl tae (called bubble tea here in England) in life and apparently loved it (got his second one then). Came back hoe with a big chocolate cake. Likely the last dinner cooked by someone else in the months to come. Ping pong match before dinner on the dinner table. Nina loved taking bath in this house. I probably had already mentioned it. After a short visit to Ravenscourt park, time to leave. Taxi came to took us to st Pancras station to take Eurostar. Immense station. In an old building, renovated. Eat. Passed the custom. Just 2 hrs of train, seeming longer as Nina was nonstop till the last 30min (of course!). Taxi through Paris to arrive chez nous ( j c & Ch’s home which they kindly allowed us to stay as they were away). It’s 1hr ahead here than London. Figured out all the switches, made the beds. I felt asleep in the couch while watching Star War.